Darrell E. White, MD, is the founder of Skyvision Centers in Ohio. 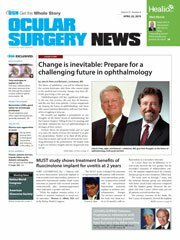 His blog for Ocular Surgery News will focus on issues related to dry eye disease. In the Aug. 25 “The Dry Eye” follow-up to my “Follow the Money” series on how drugs are priced in the marketplace, I noted that HHS announced a possible removal of the safe harbor that allowed pharmaceutical companies to pay rebates to the pharmacy benefit managers that paid for their purchases by patients. It looks like it was serious. Recently the administration pledged to change how pharma rebates were directed in order to reduce the real cost of medicine for patients. Pharmaceutical companies are now bleating that the real bad guys are the PBMs that all but demand higher list prices that can be utilized to create higher rebates. Indeed, Big Pharma is saying that its net “prices” (list price less rebate) are actually lower this year. Could be. Who cares? Patient cost is determined by list price. Anyway, in response the PBMs are saying that those rebates are being utilized to reduce insurance premiums for everyone. Not only is this reprehensible on its face (the sickest patients buying the most expensive drugs are subsidizing the healthy), but seriously? Lower health care premiums and lower cost for the insured? Show me a plan with a net reduction in cost for health care coverage. Can’t be done. It’s all smoke and mirrors meant to cover up payments going to everyone involved except the patient. I am firmly on record many times over that I do not see anything positive added to the treatment of sick people by PBMs. They are little more than one additional place to bleed out a bit of profit in the supply chain. While I’m thinking about it, who thought it was a good idea to convert all of those nonprofit BCBS plans to for-profit companies? It’s hard to imagine a PBM model in a nonprofit world. Let’s not get all kumbaya about Big Pharma, though. While researching a bit, I came across this gem: A medicine widely available on a compassionate-use basis for the treatment of Lambert-Eaton myasthenic syndrome can no longer be provided because a very slightly altered version is now FDA approved and available. The price of this new version: $375,000 per year. You can’t really blame the middleman for this one, can you? Pharmaceutical companies still bear their share of the blame. As much as I loathe top-down government involvement in health care, here we have two examples of prior government action (safe harbor for rebates/no compassionate use of older medicines) that have resulted in financial harm to patients. Is the possible strategy of shifting the rebates to the patients, as noted in this NPR article, the way to go? That’s a really big, really complex question that will take a bit more thought. Let’s just hope HHS gets it more right this time by removing the safe harbor for direct pharma/PBM rebates. Maybe then we can have some sanity, some connection to reality in drug pricing and some sense of decency in what patients are paying for their medicines. Next we can talk about hospitals and their chargemaster prices. Disclosure: White reports he is a consultant to Allergan, Shire, Sun, Kala, Ocular Science, Rendia, TearLab, Eyevance and Omeros; is a speaker for Shire, Allergan, Omeros and Sun; and has an ownership interest in Ocular Science and Eyevance.